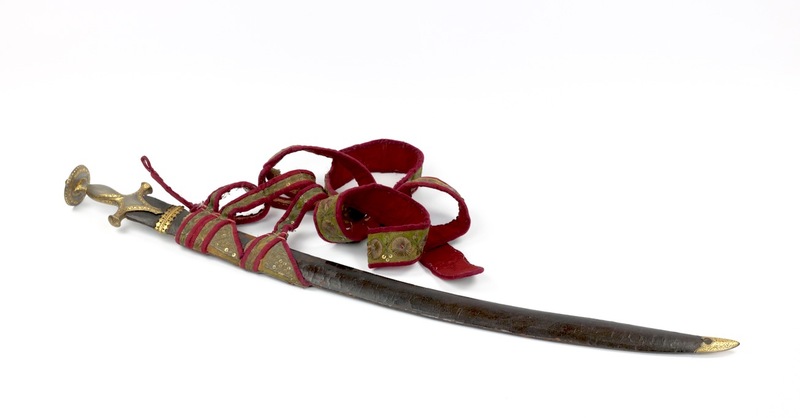 The talwar or talvār (Hindi) is the archetypical saber of India. 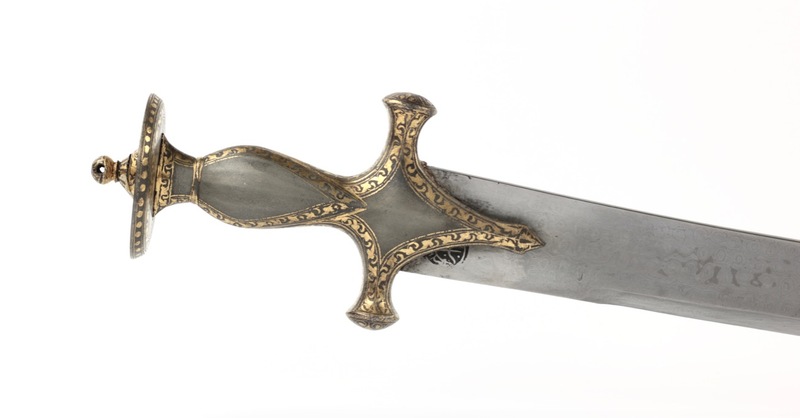 Like the swords of most culture, they were carried both as weapons and status symbols and in some cases the sword could even be sent to represent its owner. 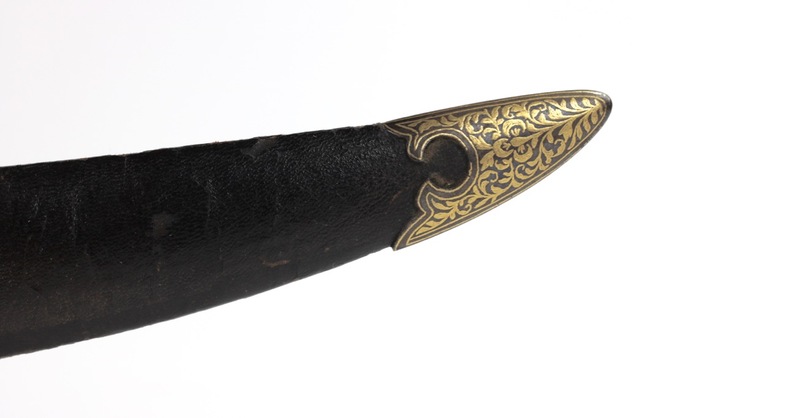 They have curved blades and characteristic hilts with large disc pommel and two quillons. 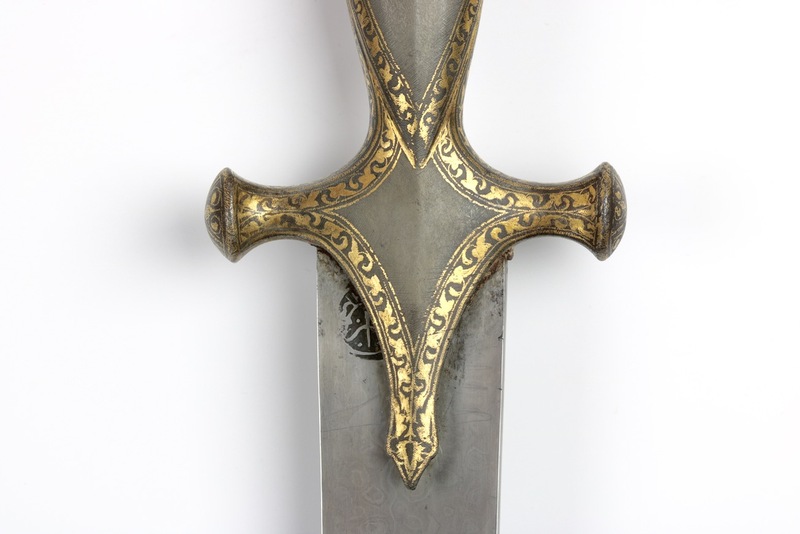 The hilt is meant to restrain the wrist into a very secure grip, limiting the ability to stretch the saber out for longer percussive strikes, instead optimizing its use for deep and powerful draw cuts up-close. 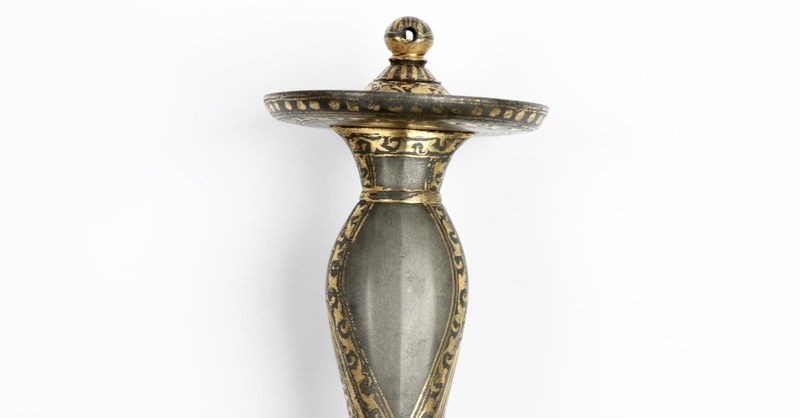 Materials: Wootz steel, pattern welded steel, gold, resin. 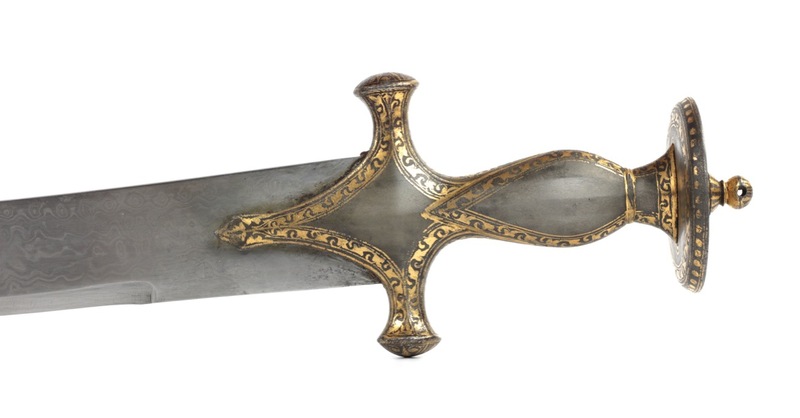 Scabbard: wood, leather, iron, gold. 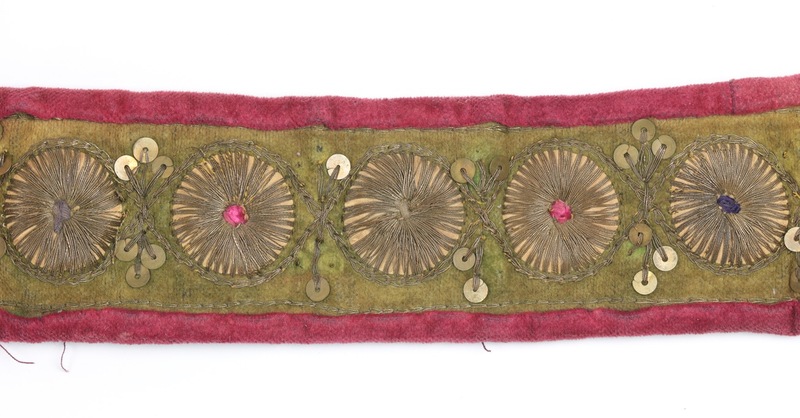 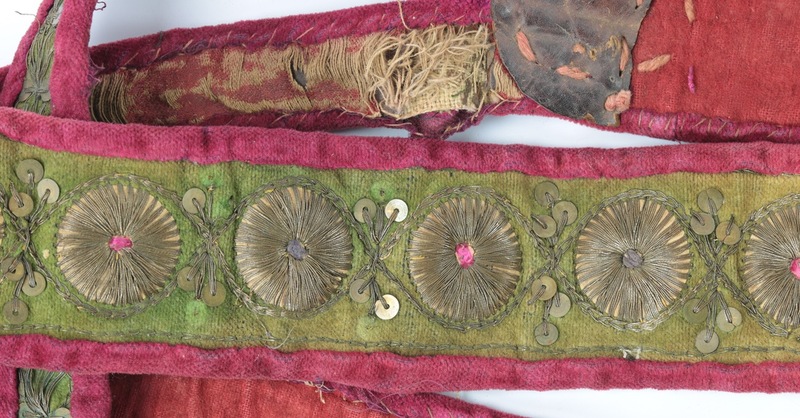 Belt: leather, cotton, silk, silver. 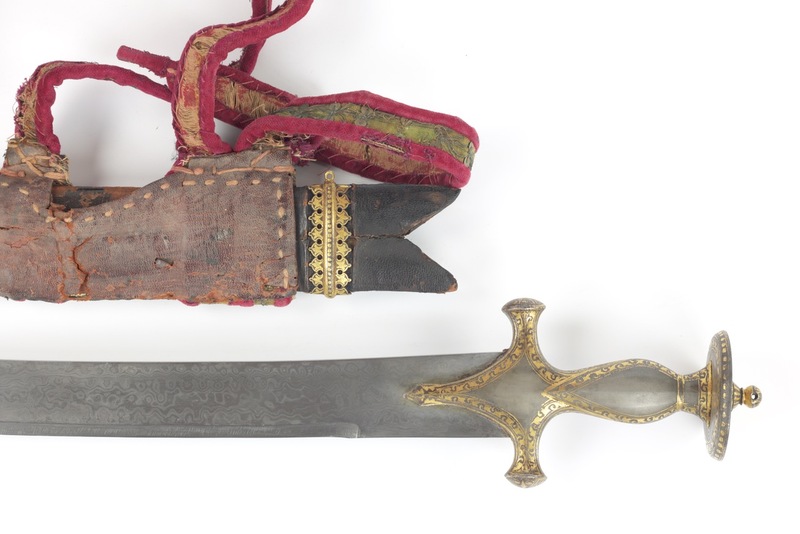 A nice Indian talwar with heavy, pattern welded “damascus” steel blade. 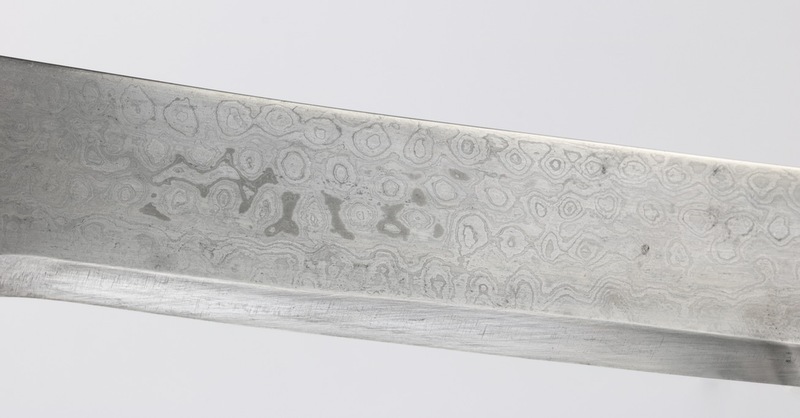 In recent polish, showcasing its pattern consisting of a multitude of dots and watery lines. 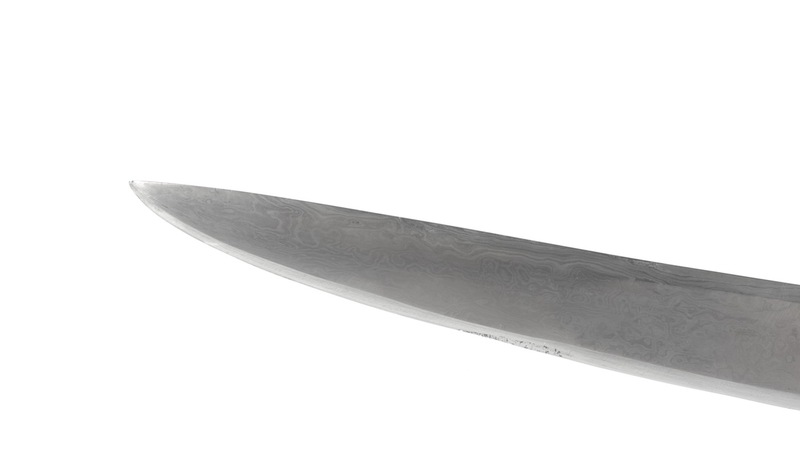 The deeply curved blade with long, well-defined backedge. 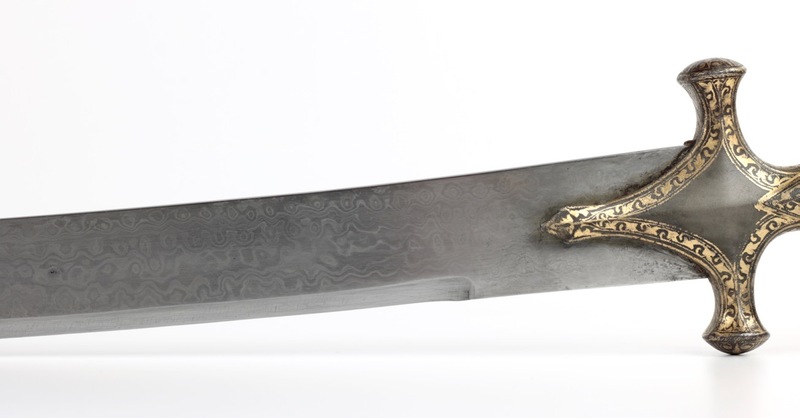 At just over 950 grams, it is a hefty piece that was not only made for show. 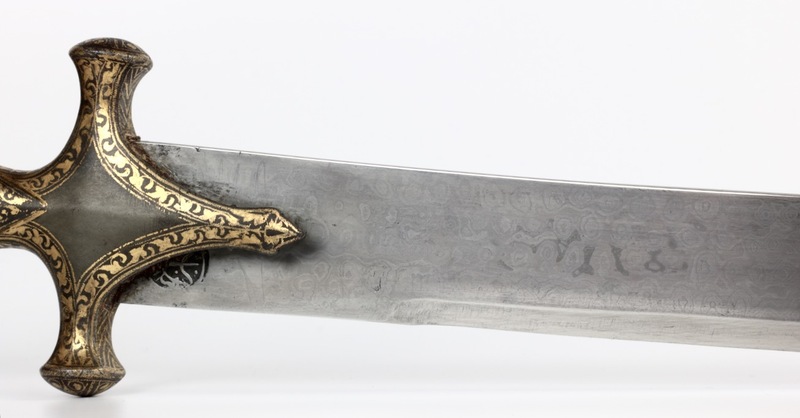 There is a stamped marking at the base of the blade showing a trident, which possibly attributes the piece to the Maratha, who marked their swords with tridents in honor of Durgā, the warrior goddess. 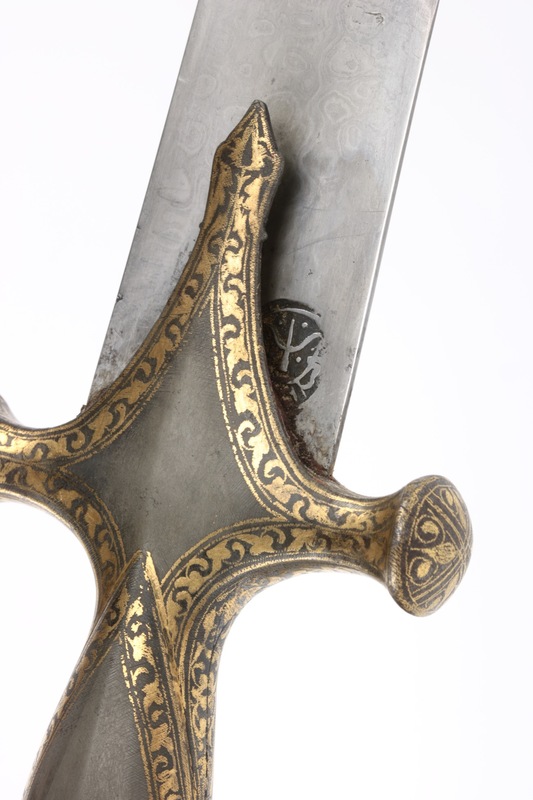 Maratha trident marking on the base of the blade. 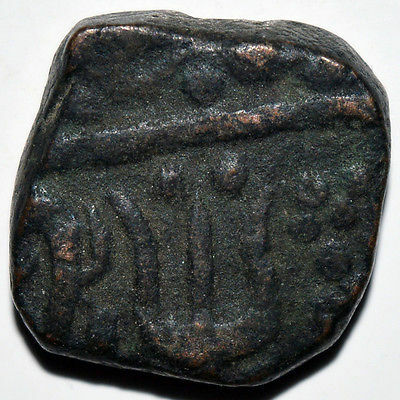 A near identical marking on a coin minted by the Maratha Independent Kingdom which lasted from 1674 to 1818. 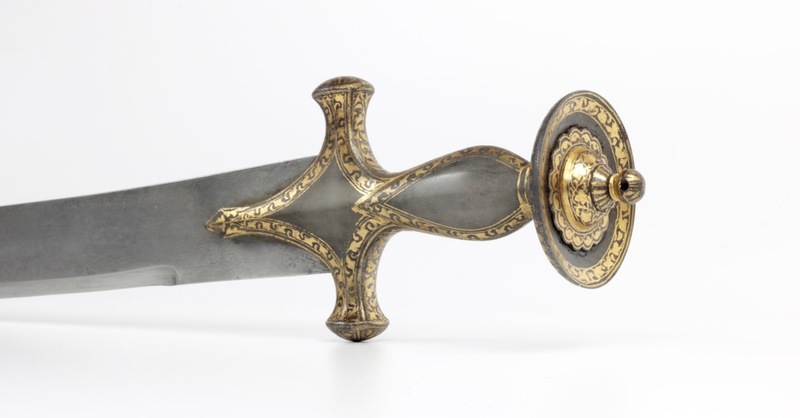 The hilt, of typical form, is made entirely of wootz steel, visible through polished windows on both sides of guard, handle, and disc pommel. 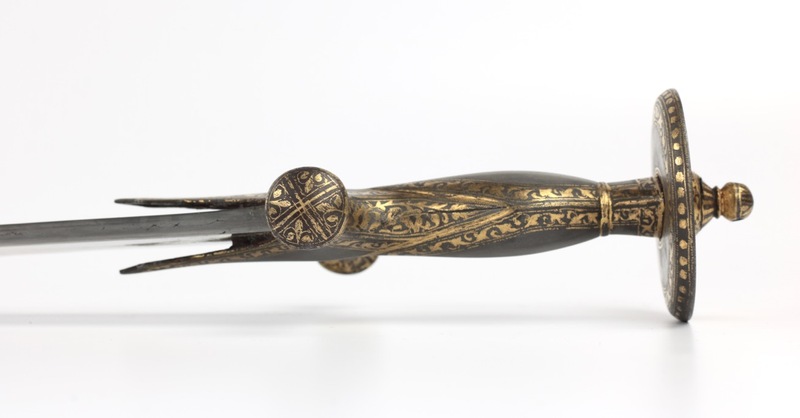 The handle is of elegant facetted shape. 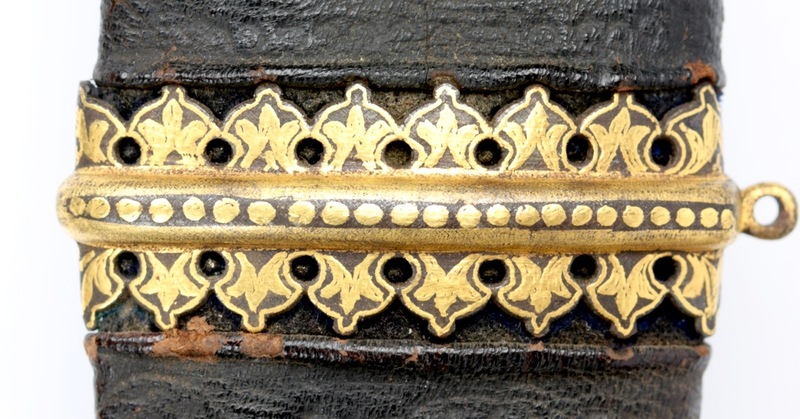 The borders of the windows that showcase the wootz are decorated with gold koftgari all around. 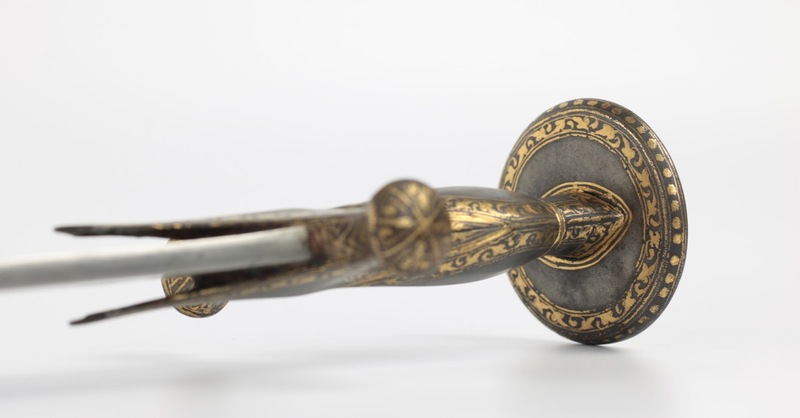 There is some minor play in the pommel. 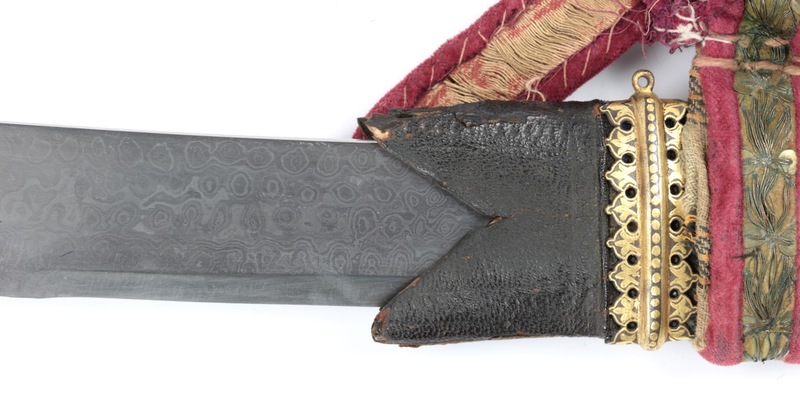 It comes in its original wooden scabbard covered with black leather. 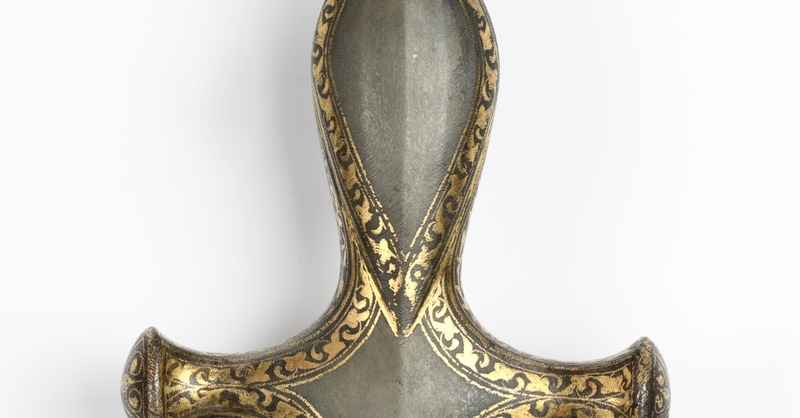 Both iron scabbard mounts still present and in very good condition still with thick gold koftgari decoration. 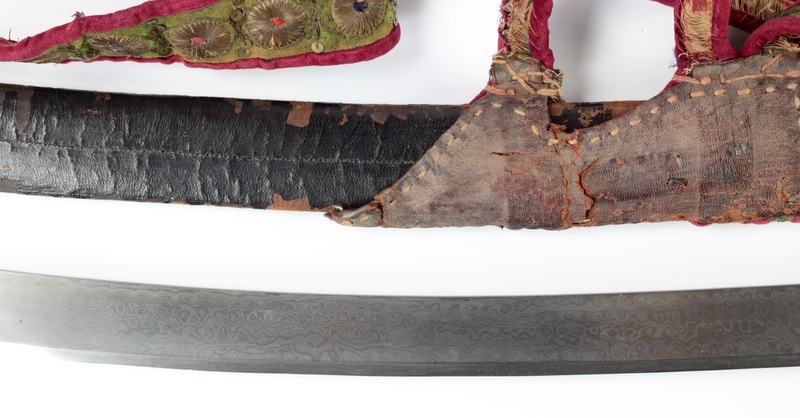 The upper piece sits tightly between two ribs in the worked leather of the scabbard, confirming it's been there since the scabbard was made. 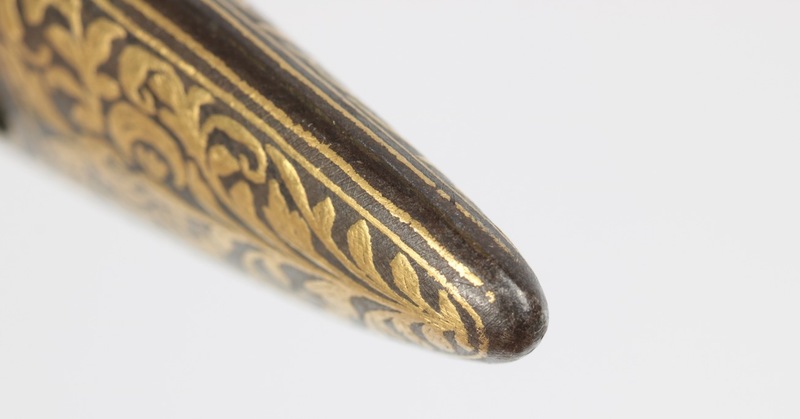 The endpiece also shows convincing signs of age under magnification. 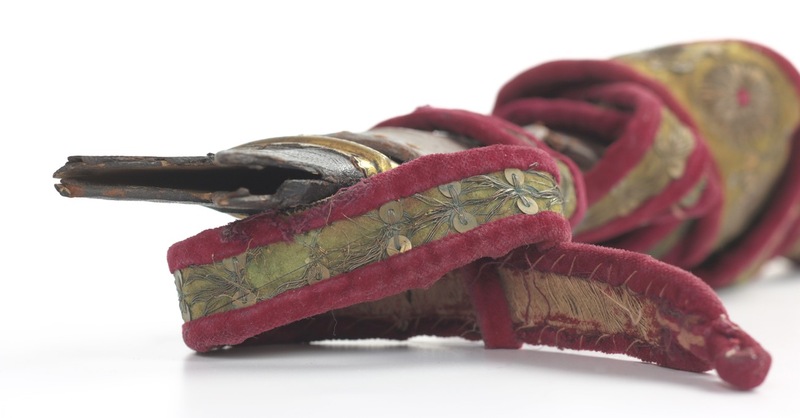 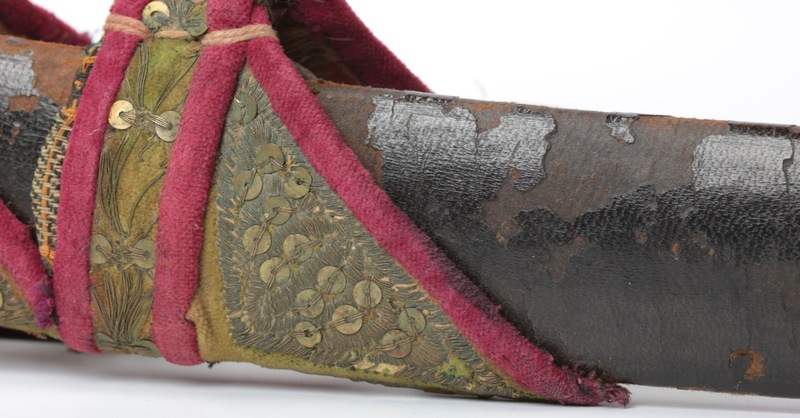 It also comes with its belt still attached, made of cotton and silver-wound threads. 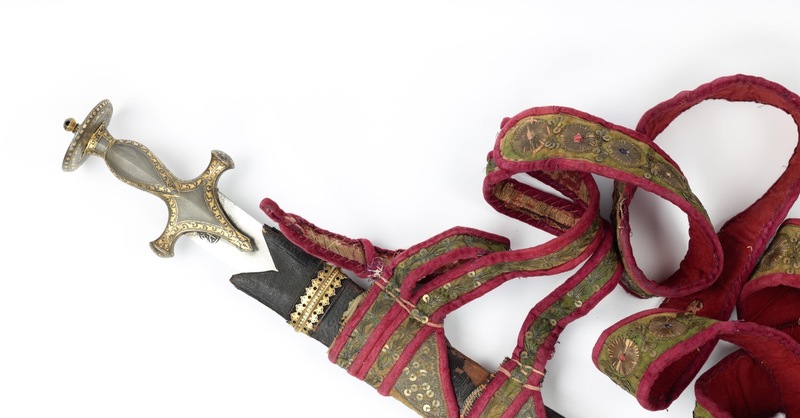 The suspension system includes a strap to go around the guard to prevent the sword from sliding out of the scabbard. 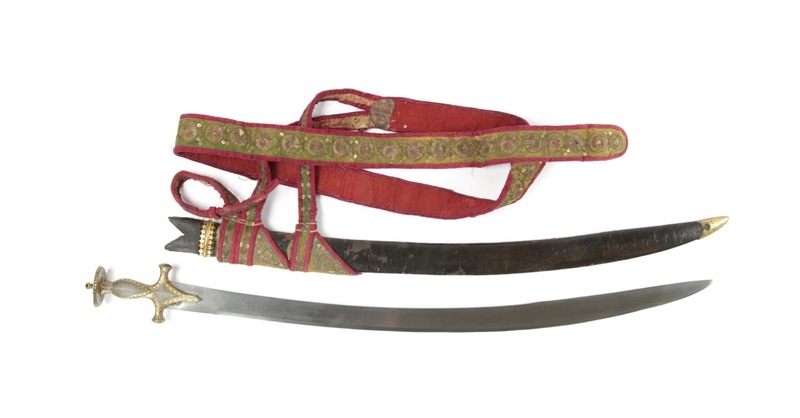 It's very rare to find a talwar complete with belt and securing strap. 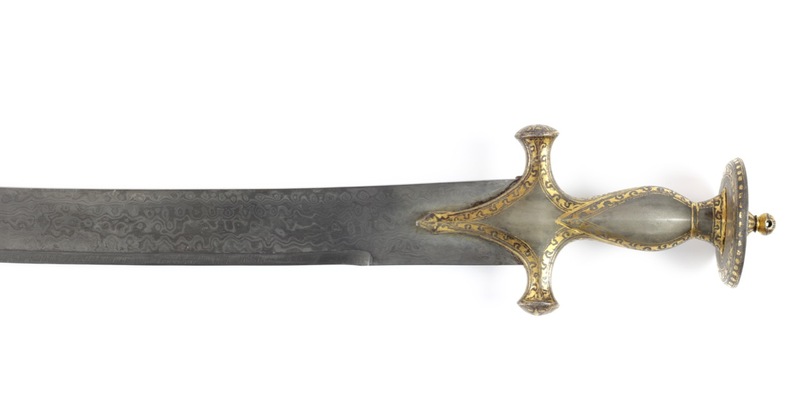 A good heavy talwar with substantial pattern welded blade and wootz handle, decorated with gold. 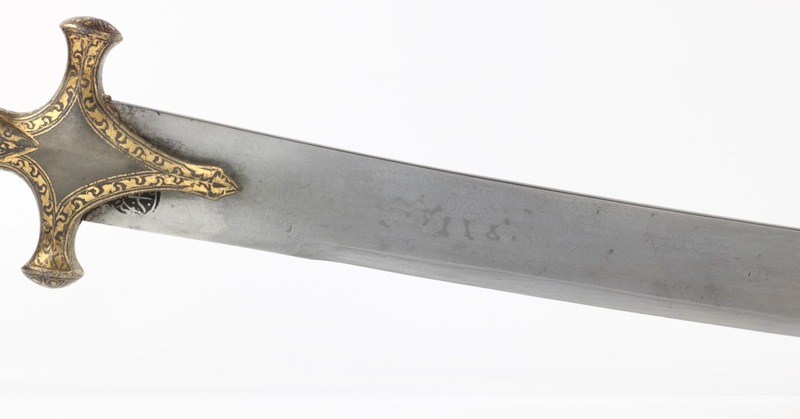 The blade markings suggest it is attributable to the Marathas. 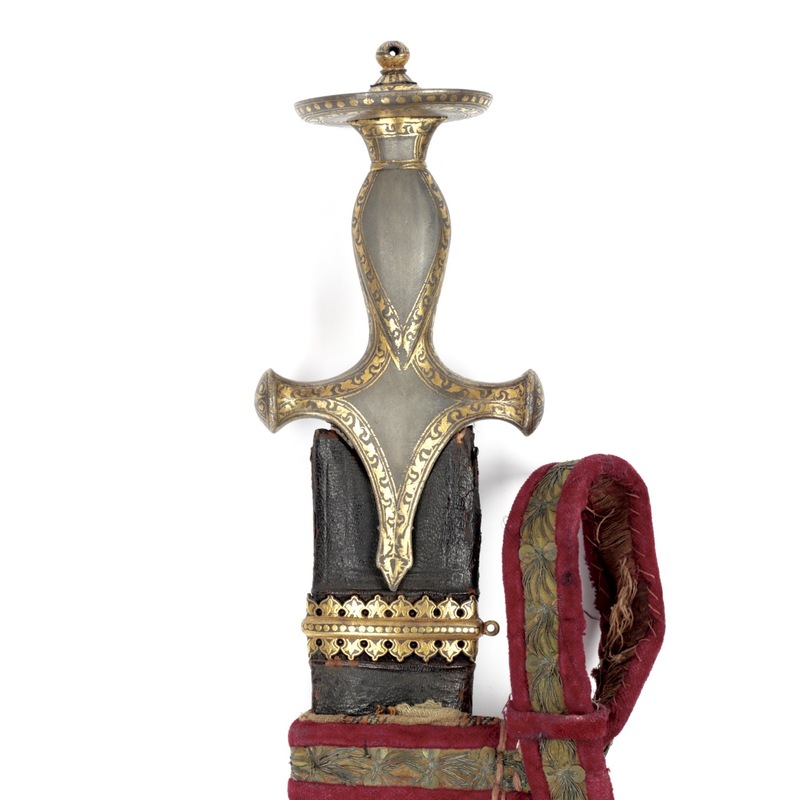 It is unusually complete, with original scabbard and belt. 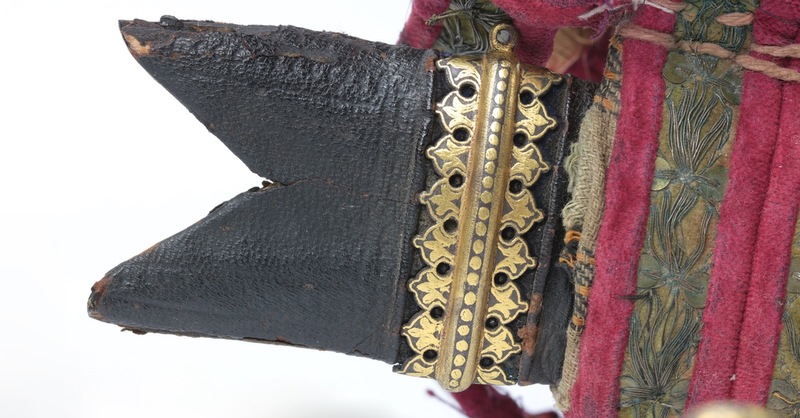 This fitting sits snugly between two undamaged ribs in the old scabbard's leatherwork, confirming it has been in place for a long time.